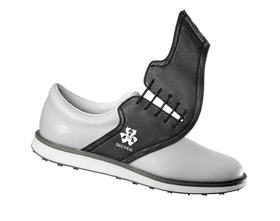 Simply stated, the coolest golf shoe ever. With over 1,875 stock color combinations and custom logo printing available, this is hands down the most versatile shoe in golf. The Innovator 1.0 is the first shoe ever to possess our patent pending (HCT) Hidden Channel Technology. This breakthrough allows the modular saddles to be swapped in and out with ease.Not only are the saddles interchangeable, they're also functional. The laces tighten the shoe just as conventional shoe with laces does. TPU outsole for optimum comfort.